Attorney General Tommy Thomas said the government is seeking several billion dollars in fines from Goldman Sachs for breaches of securities laws that involved it making false and misleading statements to investors. He said his office will seek prison sentences of up to 10 years for the former Goldman executives, Roger Ng Chong Hwa and Tim Leissner. U.S. legal filings that are part of a Justice Department civil case to recover assets bought with 1MDB funds allege the money was used to finance Hollywood films and spent on luxuries such as diamond jewelry for Najib’s wife, a yacht, artwork, and high-end properties. Leissner, who headed Goldman’s operations in Southeast Asia, pleaded guilty in the United States last month to money laundering conspiracy and conspiring to violate foreign bribery laws after the Justice Department charged him, Ng and Low in relation to the 1MDB scandal. Before facing criminal charges, Low became well known in the New York City and Los Angeles club scenes. In 2012, he threw a lavish 31st birthday bash attended by Leonardo DiCaprio, Kim Kardashian, and other celebrities. 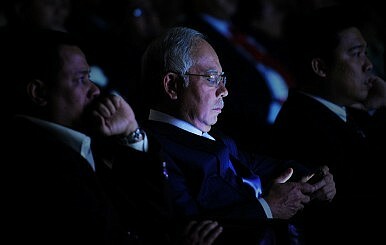 Malaysian premier Najib Razak is believed to be linked to the stolen funds. Mahathir Sets New Course for Malaysia in First 100 DaysMalaysia Silences 1MDB Whistleblower in Blow to RightsWhen Will Malaysia Hold Its Next Election?No End in Sight for Malaysia’s Power Struggle as 1MDB Scandal DeepensIs China Now Malaysia’s Largest Investor?